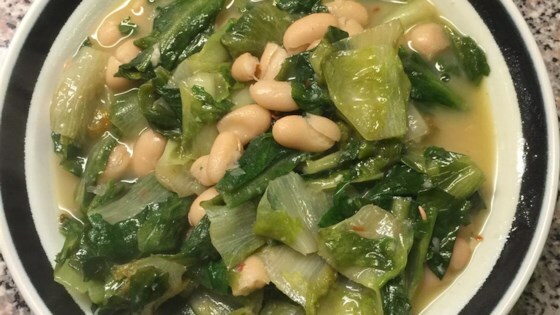 "This is a creamy concoction of escarole and beans. It's rich, and it's divine! It's also best served with a warm crusty Italian bread." This is something we grew up eating, its a wonderful comforting dish. My mother used to add a small can of tomato sauce to the recipe, its terrific and heart healthy!! I would give this 6 stars if I could. I was afraid it would be bitter, but it's not! It's delicious and I am going to make it again today! Outstanding! I made it into a soup by using only one escarole, 2 cups of chicken broth, a cup of Prego pasta sauce and 2 sliced chicken basil sausages. Wow!